802.11n USB 2.0 Adapter (1T2R). 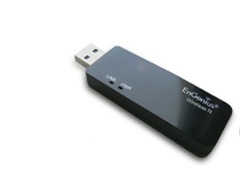 The Engenius 802.11n USB Adapter (EUB-9702) implements the latest 11n 2.0 technology which extremely improves wireless signal for your computer than existing wireless 802.11g technology. It supports the 1T2R MIMO architecture with fully forward compatible with IEEE802.11n. The incredible speed of EUB-9702 USB adaptor makes heavy traffic networking activities more flexible and takes the wireless into practical road. You could enjoy the racing speed of wireless connection, surfing on Internet without string wires.